View More In Electronic Drum Accessories. This product is made of iron, which is durable and anti-rust. With its metal chromium plating, it looks beautiful and bright, which can bring people with sense of joviality. 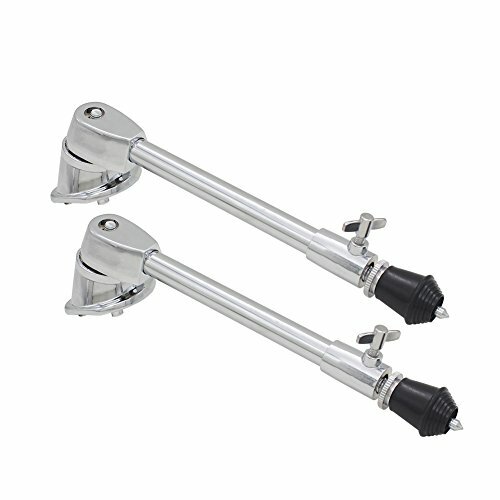 Moreover, with its firm screw design, it is more stable to use. 1. MATERIAL: The drum spur is made of iron material, environmental-friendly and anti-rust. 2. METAL CHROMIUM PLATING: The surface of the spur is metal chromium plating, it is beautiful and durable. 3. FIRM SCREW DESIGN: It can stand steadily and won't easy to deform. 4. EASY INSTALL: The drum spur is easy to install, convenient to use. 5. GUARANTEE: Our product have 180 days warranty, if you have any question about this product, please feel free to contact us, we will try our best to help you solve your problem. MATERIAL: The drum spur is made of iron material, environmental-friendly and anti-rust. METAL CHROMIUM PLATING: The surface of the spur is metal chromium plating, it is beautiful and durable. FIRM SCREW DESIGN: It can stand steadily and won't easy to deform. EASY INSTALL: The drum spur is easy to install, convenient to use. GUARANTEE: Our product have 180 days warranty, if you have any question about this product, please feel free to contact us, we will try our best to help you solve your problem. If you have any questions about this product by Dilwe, contact us by completing and submitting the form below. If you are looking for a specif part number, please include it with your message. © 2019 - tritone-guitars.com. All Rights Reserved.